MRI stands for Magnetic Resonance Imaging. 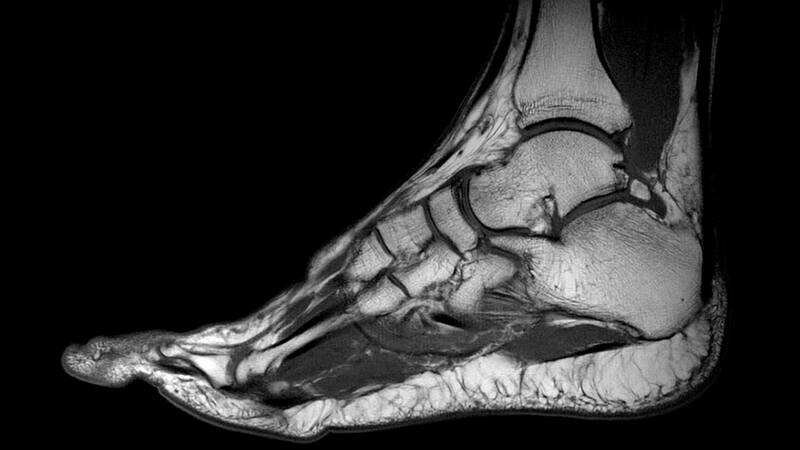 An MRI scanner uses a strong magnetic field to produce a high quality cross sectional image of the internal structures of the foot. The scanner uses a strong magnetic field to measure properties in the body's tissues. This is convert into images using computer software. What do I need to do before the MRI scan? The MRI radiographer will ask you to complete and sign a safety questionnaire, which ascertains whether MRI is suitable and safe for you. Please bring your own music to listen to during the scan . as still as possible. The machine makes a loud knocking noise when it’s scanning – you may feel vibrations under your body. The procedure is painless and you’ll be in contact with the radiographer at all times during the scan. You may be injected with a contrast agent (dye), which helps to provide clearer images and potentially aid your diagnosis. If an injection is necessary, your radiographer will discuss it with you and clarify any questions you might have. The MRI scan is performed by a radiographer and your results are reported by a Consultant Radiologist. Where does the MRI Scan take place? The Fitter Feet For Life Team can refer you to the private hospital of your choice to have an MRI scan. You will be seen for a follow up consultation at 'Fitter Feet for lIfe' to discuss the best treatment for your condition and a member of the team will provide the treatment of your choice.